Tired of shirts all over the chairs and sheets spilling out of too-small a cupboard? Expanding and improving bedroom storage is possible without ripping everything out and replacing all the furniture. The smaller your bedroom, the more you are likely to benefit. From bigger scale solutions to clever little hacks, brilliant bedroom storage solutions don’t have to cost the earth for you to be able to hide away at least some of your clutter, make things easier to find, and introduce some order and serenity into your bedroom space. This is the big one when you are looking to truly expanding your storage and buying or building new furniture. Free-standing furniture such as chests of drawers or wardrobes offers a lot of stylistic and budget choice, but it doesn’t stand flush to the wall, and it almost never fits exactly in the available space. 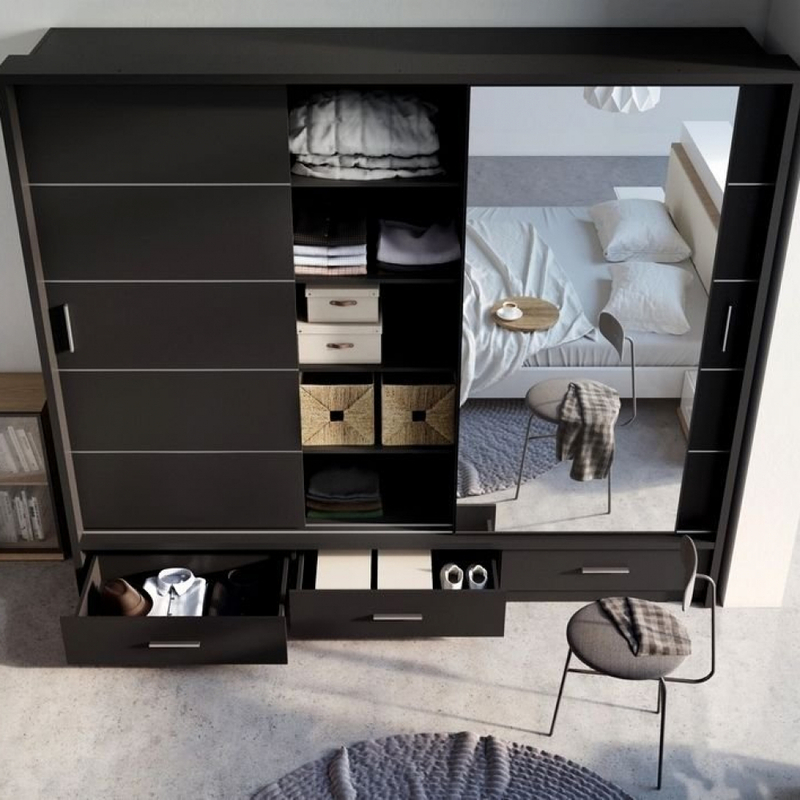 Fitted furniture is the way to go to maximise storage space. Whether you order one from a professional, DIY, or invest in a modular system of ‘’nearly-fitted’’ cupboards, you will immediately see and feel the benefits. Under the bed. There are various options, from quick and cheap (boxes, vacuum-packed bags for out-of-season clothes or bedding) to more sophisticated. As many divan beds have drawers in the base, it might be worth investing in one. Bed raisers, although not always the most stylish item, will extend your bed’s legs and expand the space underneath for all those boxes. A platform bed with drawers underneath is a more expensive solution or requires varsity-level DIY skills, but might solve much of your storage issues in one fell swoop. Use the space around the bed. Instead of a standard headboard, use an extended one that incorporates shelving and storage space. Small freestanding bedside cabinets or tables can be replaced with larger ones, or incorporated in a fitted all-in-one setup. Instead of standard low-level bedside cabinets, invest in taller, narrow cupboards big enough for hanging up clothes. A blanket chest, a trunk or an ottoman placed at the foot of the bed can store a surprising amount of stuff while often creating a visually attractive element in the room’s overall look. For safety, make sure that anything you hang above your bed is very securely fastened. Stack up. Place a smaller chest of drawers on top of a larger one, making sure they are securely fastened at the back and, with taller arrangements, also attached to the wall, or buy modular storage that can be build up. Use the higher units or shelves for rarely worn or out-of-season items. Look up – see all that space under the ceiling? Go vertical. There is often a lot of unused space higher up, and you can utilise it without the room becoming cramped. Some options include shelves around the perimeter of the room above head height, and storage above the door – this space is often nearly ‘’invisible’’ so it might even fit a slightly bigger cupboard with a door. Use corners, which, unless they are occupied with a piece of furniture, are often underused. Install a corner clothes rail for hanging clothes hangers. Fit hooks for coats or jackets. Build corner shelves above the clothes’ rails or hooks. If placed above head height, these can be larger and fit boxes filled with stuff (hat boxes often look attractive, and they don’t really have to be used for hats!). Use room and cupboard walls. Removing freestanding pieces will free floor space, and installing various boards can help tidy up your small items. Consider wall mounted lights instead of table or standard lamps. Pin jewellery to a corkboard instead of using jewellery stands or boxes that occupy flat surfaces. Extend this concept further and fit a pegboard which will allow you to flexibly store slightly bigger and/or heavier items. Use a wall-mounted shoe rack, especially suitable for dress shoes whose soles are less likely to be dirty. Instead of a floor-standing laundry hamper, use one that you can hang on the wall or the back of the door. Some furniture doesn’t need legs: wall-mounted (floating) desks/counters and shelves will free extra space underneath. Use the air! Hang things from the ceiling for creative storage solutions. You can use hanging wire baskets (just like ones used for fruit in the kitchen) to store socks, hats, scarves and free some space in your chest of drawers. One of the best ways to painlessly create more storage is to double up. Use small chests of drawers or cupboards instead of tables (including nightstands or side tables). Bedroom seating is particularly good for doubling up as storage. An ottoman at the foot of the bed, or used as a widow seat is a great option. A storage stool will work as well as a chair or a standard stool in front of a dressing table. Some laundry hampers have a moulded cover that works as a seat. Start with a cull. The sensible rule for most clothing and footwear is: if you haven’t worn it in a year, it has to go. This rule can be extended to two years for specialist items, such as camping gear or timeless white-tie evening attire, but is a good guideline in any case. Introduce seasonal rotation (especially if you live somewhere with clear-cut seasons). Flimsy summer dresses and shorts are unlikely to need to come out in February, and the huge Aran sweater or a down jacket are better put away in the summer. Pack those clothes away in a hall cupboard, on a high shelf in a wardrobe, or vacuum bags, and clear some space for current use. Organise your wardrobe. There is often a space for a shoe rack, extra poles for trousers or racks for jewelry or scarves. Use the inside surface of the door or the back wall of the wardrobe for hooks and extra racks. Organise your drawers. Use dividers/organisers to keep things more orderly and to make it easier to find smaller items. This way you will be actually able to fit more things in! Use light and portable pieces of storage-furniture. These include baskets and canvas bags, in which you can put cushions, blankets, throws or even shoes when you want them out of the way. When unneeded, canvas bags can be put away, while light baskets can be moved around and won’t feel like a permanent fixture in your bedroom.